The Chap Measuring Press is a precision marking tool. The three-axis of freedom, hand cranked, and easily constructed design allows users with no previous marking experience to easily learn how to operate an XY-axis screw powered machine and accurately mark parts for further machining. The purpose is to reduce manufacturing errors and inefficiency by pre-planning. Our implementation of the design and the project as a whole had several issues, but the prototype of the design was completed and the team learned valuable lessons from the project. The Chap Measuring Press will be a desktop tool that will allow accurate marking utilizing a 3 axis linear slide system. 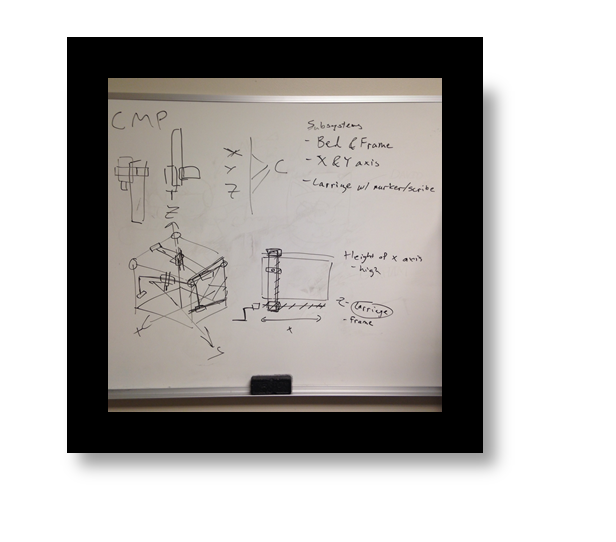 The design process, like any other project, started on the whiteboard. After outlining the product specifications, we began by first looking at different sets of 3 axis of freedom options that are commonly seen on CNC machines and 3D printer. 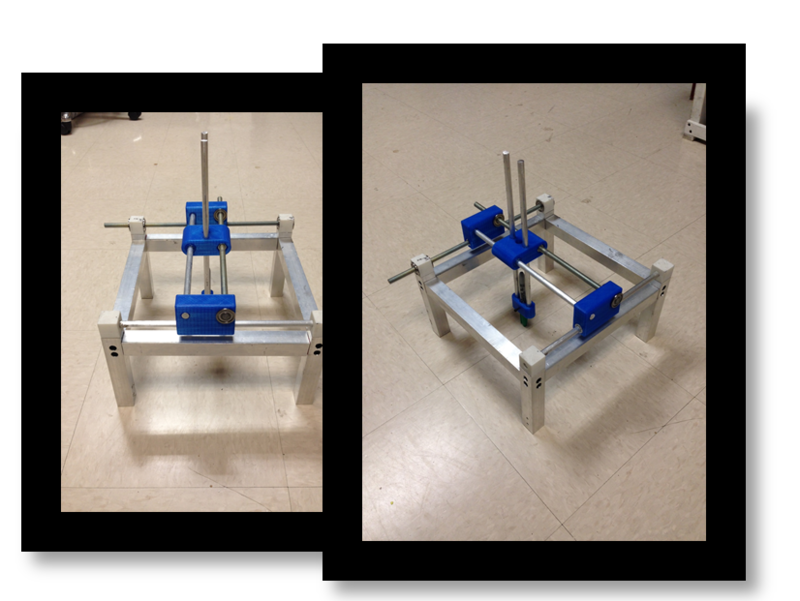 The X axis being on the frame with the Y axis set up as the carriage with an unpowered Z axis seemed like the best option. This was because this system of powering the tool seemed the simplest to build and there seemed to be the least possibilities of failures with this design. From this decision, we were able to move onto establishing the sub-systems and who was going to be responsible for developing each one. In the succeeding meetings, the team worked on developing the Computer Aided Design of the entire assembly using SolidWorks. The overall design is driven by having 3/8″ all threads as the lead screws and the carriages have 3/8″ nuts to actually transfer the torque to vertical power. 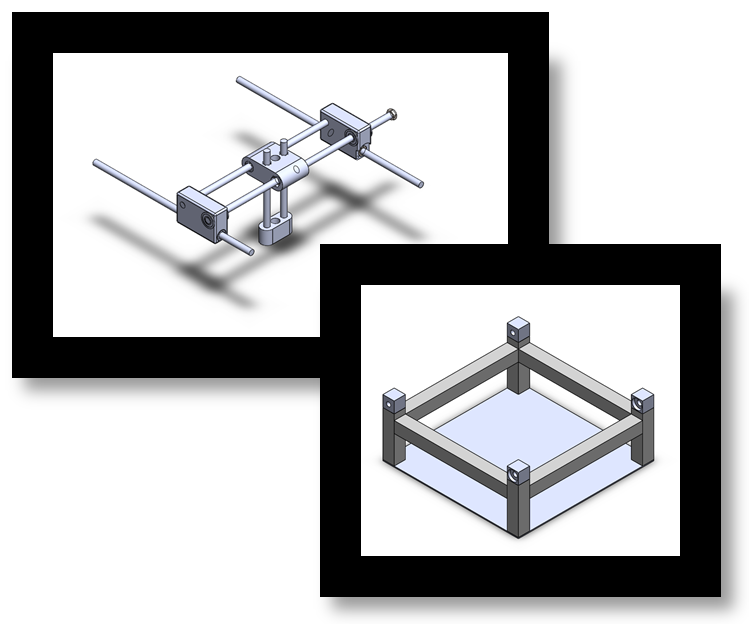 By having two nuts per axis of freedon, the 3D printed carriages are able to be simplified significantly with the nuts sandwiching the carriage. The manufacturing of the tool involved the 3D printing of 19 pieces, 8 channels, 2 all-threads, and 2 cylindrical rods. X Axis Carriages: 3D printed pieces with two different configurations with one for holding the two nuts to run along the all-thread and one to hold two “slides” which are cylindrical pieces with a gear shaped hole that will have less friction against the aluminum rod when it slides over it. 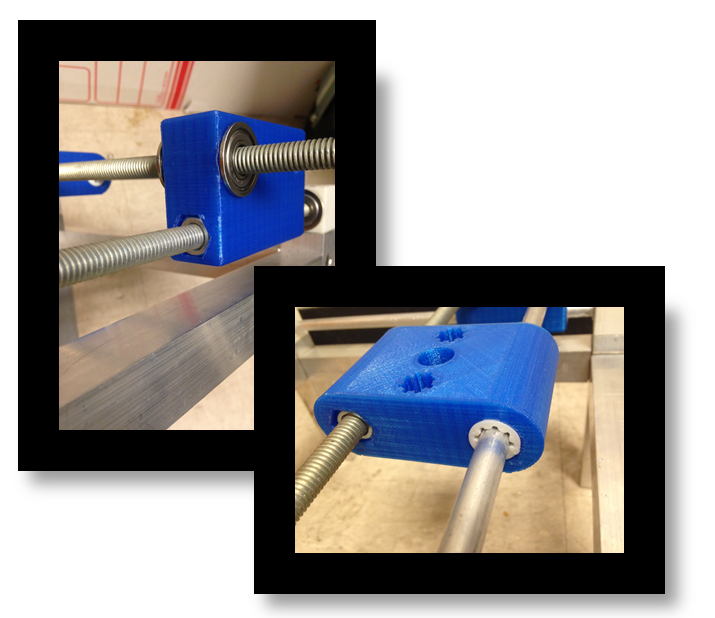 Y Axis Carriages: Single 3D printed piece used for carrying the Z axis. The one piece structure allows the carriage to be very stiff and have little binding problems. This one piece model has two gear shaped holes for the Z axis rods. Frame: 1 by 1 inch aluminum channels were cut to size and had holes drilled in them for easy assembly with 3D printed connector pieces that were press fit into the ends of the channels. The first iteration of the connector pieces was a cube with many “fingers” extending from it that would be fitted into the channels. This design was soon found obsolete because it would have taken several days to just print all of the required parts and were replaced by the simple-press-fit connector cubes. This new design was simply pressed into the ends of the channels and the two tapped holes at the end were used for connecting to the vertical channels in the corners. 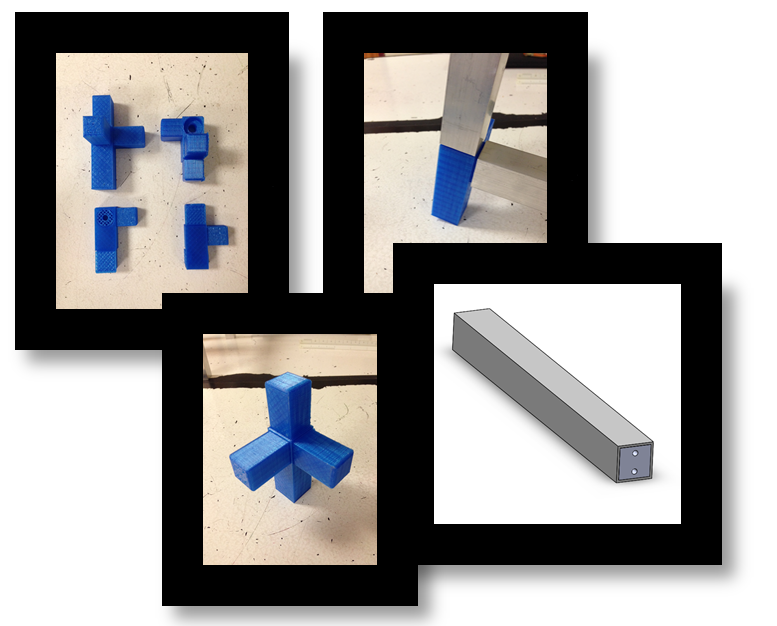 Even with the improved connectors, the print time for the entire project seemed too long for the benefits the tool offered to the user and further progress on the design led to the team’s understanding that the tool will not be very useful. The project was found to have many flaws halfway through the design process. The project was found to be significantly limited in its usefulness, and the design took many hours to be 3D printed. However, the testing that was done with 3D printed components yielded a better understanding of 3D printed parts by the team. – When printing pieces less than 1″ in diameter, it is necessary to have the clearance between two parts less than 0.002″ to ensure a proper press-fit. – The general design of the X and Y carriages did in fact work with the simple solution involving the use of two nuts sandwiching the 3D printed piece. – The slides, used for mounting parts to be slid on the aluminum rods were successful and resulted in minimal friction, although the performance might have been slightly better with less clearance than the 0.003″ that was given. – Tapping 8-24 holes in 3D printed pieces yielded no issues. However, the holes created by the 3D printer must be drilled out with the correct size drill bit before tapping.